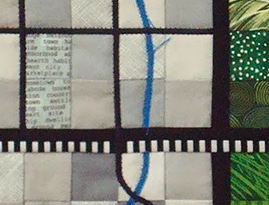 Childhood’s Wide Avenues | OccasionalPiece--Quilt! 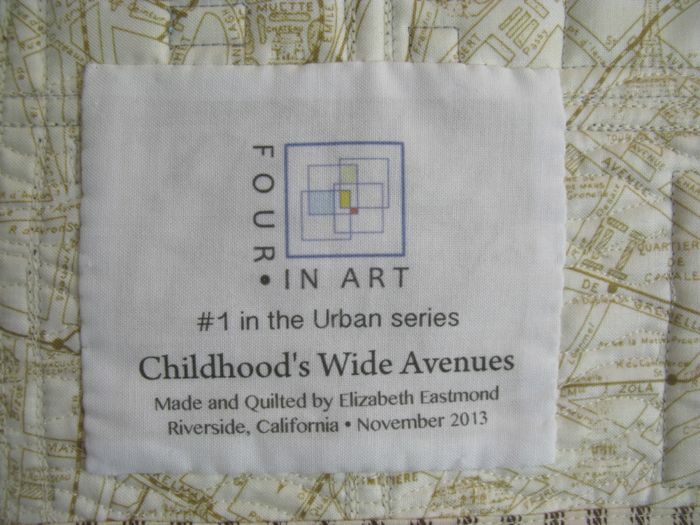 Posted on November 1, 2013 by Elizabeth E.
Childhood’s Wide Avenues is a quilt about memory, of fixing in time a place and a feeling. I grew up in the mountain west, in Provo, Utah, a town laid out in a grid of wide avenues, criss-crossed with streets that seemed to me to be wide as the sky, although I’m sure if I went back there now, they would be reduced in size and dimension. But that feeling that I could ride my bike to the top of the street near our house and see all the way down to my elementary school, or across the valley, or to the other side of the world has remained in my memory. 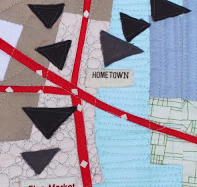 A few weeks ago, as I was thinking about this quilt and how to express the theme of Urban/Maps, I found myself traveling down another very wide avenue through the middle of a town very unlike where I grew up: San Bernardino, California. But the boulevard was so wide and so straight and I could see it head in a straight line for miles, up into the foothills, that I felt as if I had been transported in an instant back to an earlier place and time. But it seemed impossible, until I learned that Mormon pioneers, a branch off the same tree that laid out Provo, had also laid out the wide avenues of this town two states away, in the early 1850s. Asked to settle this place far from their original homes in the Utah valley, they laid out a grid of wide avenues, and gave them names like Salt Lake Street, Kirtland Street, Nauvoo Street, and Utah Street. These have all been renamed, but those early pioneers left their stamp on the valley not only by naming the cemetery Pioneer Cemetery, but by etching long, wide avenues into the landscape. I had heard about memory being triggered by sounds, and by smells, but never had experienced memory being triggered by a sense of space, of a geographical series of landmarks making headway into my childhood memories. 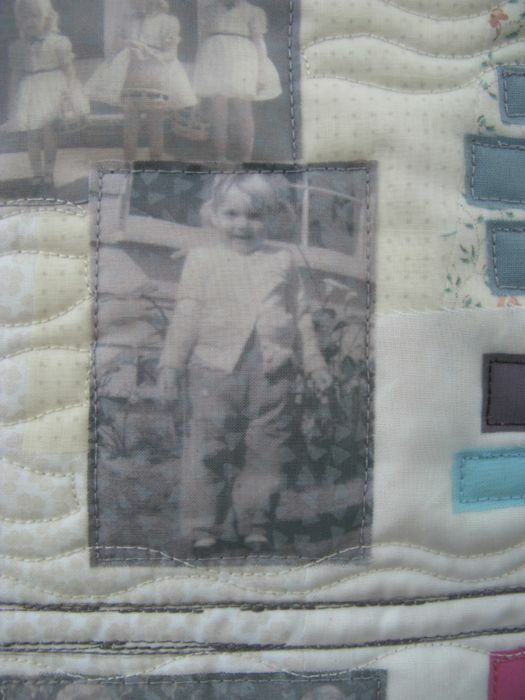 For days afterward, I thought of the family I grew up in, and found pictures to place on my quilt that evoked a sense of that time (that’s me, above). 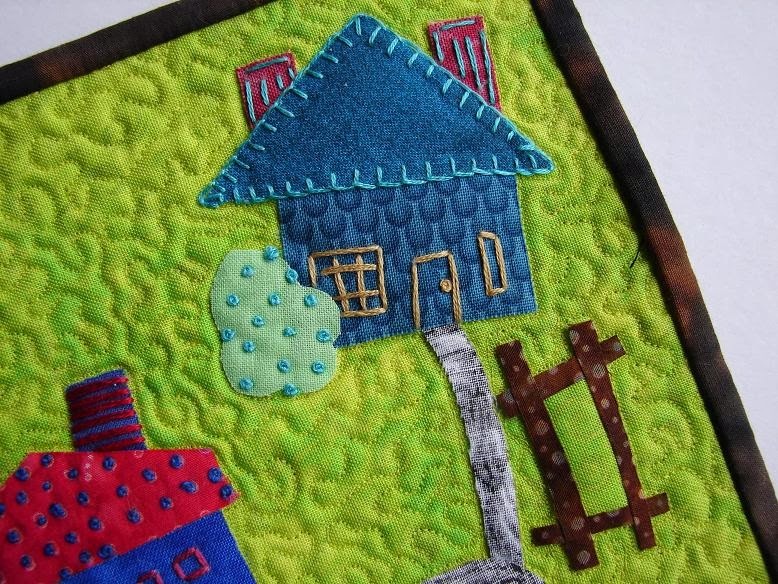 Who populates these fictional houses on my quilt? The large pink house is my parents’ and the block below contains houses for my husband and I, and our four children and their families, while the blocks surrounding that central block are where my sisters and brothers might live. 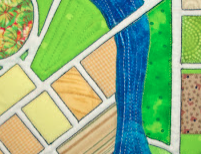 And because all of their spouses will want their own families, I scattered the grid of avenues with more houses, so that the circle of family would have place and space. A dream, of course, as none of our children, nor any of my family live near us. But in my world, in my memory, we are all there: gathering Easter eggs on the front lawn, jumping in piles of leaves, finding tarantulas in the fissures in the hillside, cracking open walnuts, and smelling the lilacs at the end of the driveway — lovely, amber-colored scenes. Amanda of What the Bobbin? This is a finished goal on my Quarter Three of the 2013 Finish-A-Long, hosted by Leanne of She Can Quilt. It is also Quilt # 124 on my 200 Quilts List. Sometimes, Elizabeth, I don’t know what I love more – the four-in-art quilt or the wonderful story, so eloquently told! I am dying to hear and see more…. Beautiful, Elizabeth. You are such a good writer as well. I totally think a place can recreate a memory. The picture of you is adorable, of course. 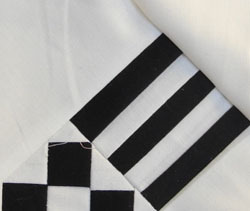 Love that your quilts are always personal. Memories are so cool, I have such visual memories and totally get what you must have experienced. Don’t you wish that everyone you liked lived on the same block or around the corner. It is a lovely quilt and such a nice inspiration. I too grew up with that sense of space and freedom. I have always thought that where I live now is very similar to my childhood home–near a canyon, ringed by mountains, non-urban, quiet streets, friendly neighbors. I love that you have captured this sense of childhood awe in your quilt. What a wonderful quilt – and your description was superb. Your words drew pictures that I could so relate to – thank you for being so eloquent. I love this quilt. Your imagination took you in an entirely different direction! The colors are great! I love the story behind this quilt. 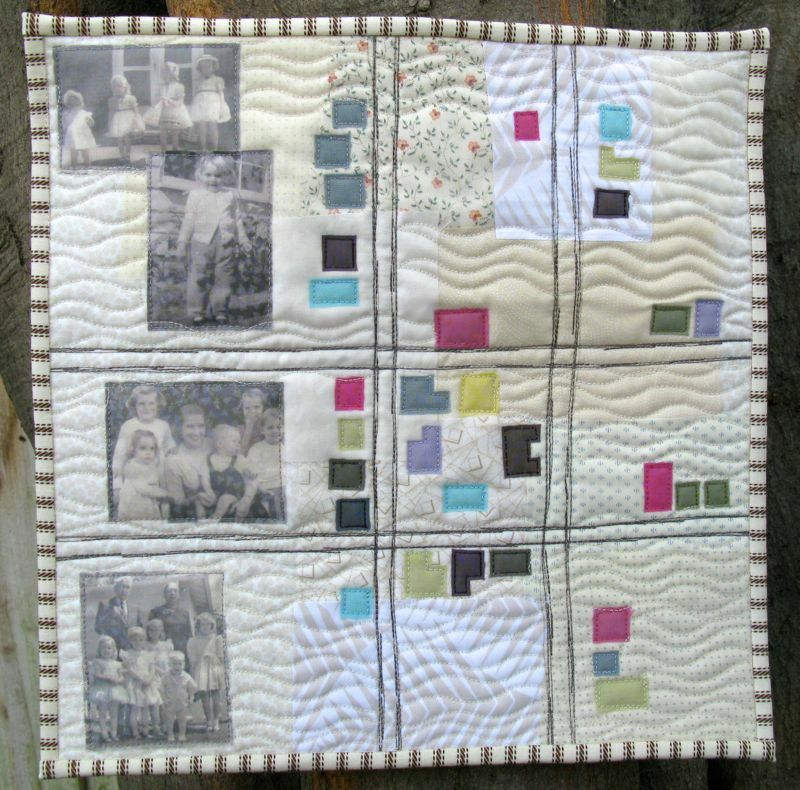 I love the layers of the quilt, like the layers of your story and generations on your family. Wouldn’t it be great if we could keep all of those who are so dear to us so close in proximity? The colors you chose also bring a sort of dreaminess quality to the quilt. Like memories and dreams sometimes cross paths…or avenues. Those pictures are fabulous! I love that these days we all take so many pictures and I hope people will still treasure them as much as we treasure the pictures before the digital age. Elizabeth your writing skills so beautiful describe your quilt and your story. The idea of the perfect neighborhood full of family is a heartwarming thought to those of us with no family nearby but it is how I grew up. I love how things can trigger memories so clearly in our mind. For me it is often a visual or a smell. Well done on all accounts. So glad to be a part of this little group. How creative you are, Elizabeth! I would love to live in your neighborhood too! I echo all the sentiments above. This is so cool!! I love art that is such a personal expression. Beautiful work, thanks for bringing us on the journey! Such a wonderful depiction of your memories. So many ways this topic of maps could have been expressed and you did a fine job. I, also, enjoy your ability to use words so expressively. I so look forward to these posts!! Another great piece. Although fresh and modern, there’s a wistful nostalgia to it. If Mondrian had scrapbooked…! I love, too, how the lines of streets and your colourful houses call back to the Four-in-Art logo. A lovely completeness to this piece. 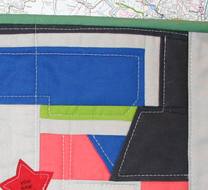 Elizabeth, I am so impressed with your map quilt! I love reading your interpretation and the pictures on your quilt are a perfect touch! I look forward to your future post deconstructing your process. What a talented group you’ve gathered! 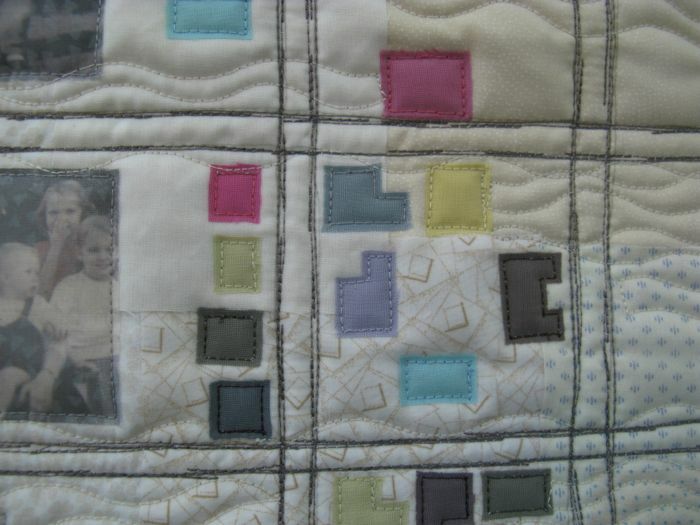 Pingback: Childhood’s Wide Avenues, deconstructed | OccasionalPiece--Quilt! great story and great quilt!! it is a treasure! 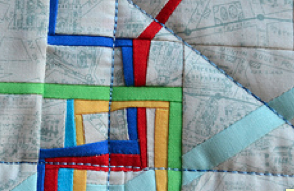 Pingback: 2013 Finish-A-Long, Quarter Four | OccasionalPiece--Quilt!